Easy to use: Simply insert 2 AA batteries (not included) and chose your attachment. Attachment will easily attach to the nail file. Then press the start button. That's it! Money Saver: Stop spending money at the salon! Get a salon quality experience at home with this electric nail file. Versatile Interchangeable Attachments: Includes 5 replaceable attachments. Remove shape, buff and shine your nails all with one tool. Portable and Comfortable: Ergonomic design ensures comfort, for use on both fingernails and toenails. Comes with a satin carrying case for travel. 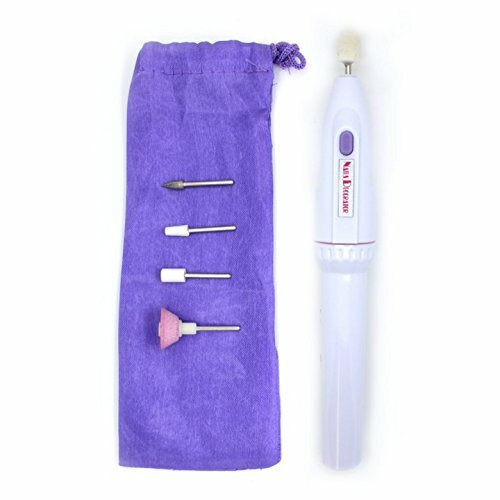 Cordless For both natural and acrylic nails 5 interchangeable head attachments: Sandpaper grinder: Quickly and effectively files the nail edge. Shorten thick nails easily! Chromium corundum grinder: Safely and painlessly grind the edge of your nails. White corundum grinder (cone): Smooths the nail surface for a beautiful finish. Carborundum grinder: Remove dead and dry skin around your nail. Can also be used to remove calluses and to push back the nail cuticle. Felt grinder: Polishes your nail for a easy nail polish application. 5 TOOLS IN 1: Buff, polish and easily remove calluses 5 re-changeable tools and no cord. REMOVES: calluses, rough edges, and pushes back cuticles.Polishes to a high finish. If you have any questions about this product by A List Finds, contact us by completing and submitting the form below. If you are looking for a specif part number, please include it with your message.